Here's another one of my favorite Filipino desserts. It's called crema de fruta (which translates to "fruit cream") and it's what I'm making for our family gathering this Christmas. I'm not sure why this dessert is so synonymous with the holidays, but why ask why? All that matters is it's sooooo good! 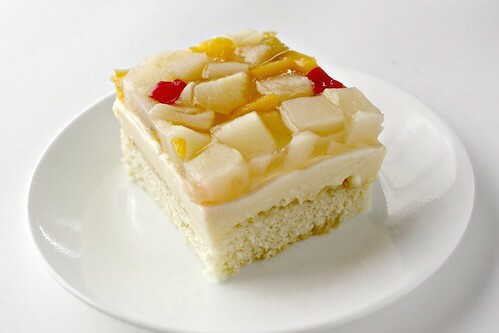 There are so many variations of this dessert but the one I'm familiar with is a sponge cake layered with stirred custard and fruit cocktail and topped with unflavored gelatin. My mom gave me a recipe for crema de fruta a long time ago but it only had instructions on how to make the custard and fruit gelatin - not the cake. She told me that when she makes it, she just goes to the local bakery and asks to buy a sheet of sponge cake, the same kind that's used to make jelly rolls. This saved her time baking, especially during Christmas when there's so many activities going on. I decided to use a hot milk sponge cake for my version of crema de fruta because it's quicker and easier to make than traditional sponge cake. If you're really short on time, you can just buy the sponge cake at a local bakery like my mom did. Ladyfingers or pound cake are good substitutes as well. I also added a little cake syrup, a secret ingredient that most pastry chefs use to keep cakes moist. It's basically simple syrup that you add flavored liquers like Grand Marnier or kirsh. Merry Christmas! Maligayang Pasko! Joyeux Noel! Preheat oven to 350 degrees F. Grease and flour a rectangular glass baking pan (I used an aluminum pan because sometimes I forget to bring back my baking pans during potlucks or family gatherings). Sift the flour and baking powder together. Set aside. In a mixing bowl, beat the egg yolks until thick then slowly add the sugar. Continue mixing until light and fluffy. Gradually add the flour mixture. In a saucepan, combine milk, butter and vanilla extract; cook just until the butter has melted. Slowly pour into the batter; mix until combined. Pour into prepared pan then bake for 20 to 25 minutes or until a toothpick inserted into the center of the cake comes out clean. Let cool completely. Place sugar and water in a saucepan; cook until the sugar has dissolved. Drizzle lightly over the sponge cake. In a saucepan, combine sugar, flour and milk. Cook in medium-high heat, whisking constantly, until it thickens. Pour some of the mixture over the egg yolks and mix together till combined. Add the egg yolk mixture to the saucepan. Cook for a few more minutes then remove from heat. Stir in butter and vanilla extract. Pour over the sponge cake. Let cool. Using a strainer or sieve, drain and reserve the syrup from the fruit cocktail in a medium bowl. Sprinkle the unflavored gelatin over the syrup. Let the gelatin "bloom" (absorb liquid and expand), about 1 to 2 minutes. Microwave for 30 seconds to 1 minute to melt the gelatin. Set aside. Arrange fruit cocktail over the cooled custard. 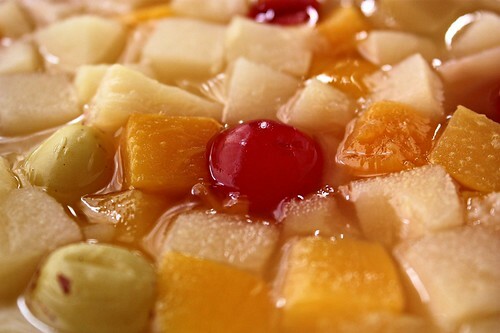 Carefully pour the gelatin/syrup mixture over the fruit cocktail and custard. thank you. this is so easy to follow. just to know what kind of milk, i have to use?living here in abroad. Hi! I used whole milk for this recipe, but my mom used to make it with canned evaporated milk. Hi! I wanna try your recipe. Can you use an oven toaster instead of a microwave to melt the gelatin? thanks!